Regardless of your age, background or health goals, we’ll work with you to customize a care plan that will help you heal as fast as possible. Whether you’re interested in combining services or receiving acupuncture or chiropractic care alone, we welcome you to begin your journey today! This precise, gentle and effective technique is a great way to provide relief from back pain, neck pain and more. Using the low-force, high-speed Activator Methods® instrument, Dr. Clemenson is able to adjust the affected area quickly and effectively. With her fellow from the International Academy of Acupuncture, Dr. Clemenson enjoys offering the effective, complementary therapy of traditional acupuncture. Whether you’re looking to combine the benefits of both chiropractic and acupuncture or just acupuncture alone, we welcome you! Using a MR4 cold laser, we can help you heal soft tissue injuries from the inside out, starting at the cellular level. 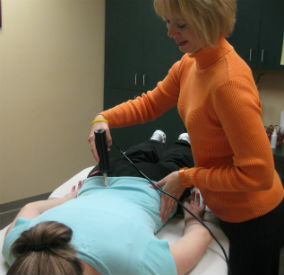 This cold laser therapy can help you heal faster by improving circulation to the acute and inflamed areas. The comfortable, five-minute session is relaxing and pain-free. Safe and gentle, cold laser has no side effects. Dr. Clemenson also utilizes Exercise Rehabilitation and Physiotherapy, in conjunction with traditional chiropractic techniques, to help restore movement and function after an accident, injury, or live-changing event.